May was an incredibly busy month. First, due to timing I had about a week to wrap things up at my old job. It was bittersweet given that I had been there for 4.5 years but I was also excited for the challenge of my new job. After finishing up at work I then spent two weeks in Peru, a trip that we’ve been planning since January. Dan and I had an amazing time in Peru where we conquered the classic Inca Trail to Machu Picchu. I’ll be posting more about that later. 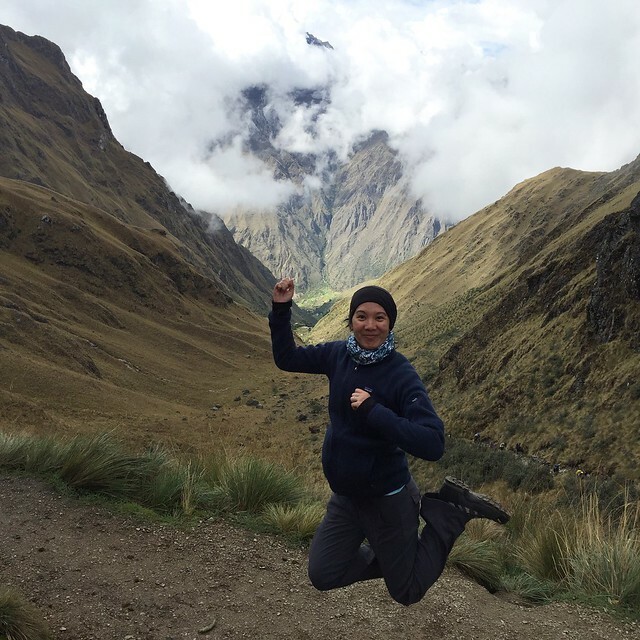 I jumped for joy after summiting Dead Woman’s Pass (over 4,200 metres above sea level) on Day Two of our Inca Trail trek. Being a long distance runner definitely helped, but not in the ways that I expected. I’ll do a blog post on that soon. While I was in Peru I also found out that I would be joining the Digital Champion community for the Scotia Toronto Waterfront Marathon (#STWM). I am thrilled to be part of this inspirational community and looking forward to connecting with other runners online and in person. This also means that I am committed to running my second full marathon. I’ll be sure to post updates on my marathon training from now until the race. It’s been busy but that’s just the way I like it. I’m looking forward to this summer and will have more updates soon (such as a recap of my 10th half marathon, which I ran less than a week before flying off to Peru). Stay tuned! We hiked Machu Picchu last year. Isn’t it incredible?!?!!! Which tour company did you guys use? It’s amazing! I couldn’t stop looking around and going “wow!” I still can’t believe that we did it. We went with Alpaca Expeditions. My friend went with them last year and recommended them. They were fabulous! Which company did you guys use? OMG! We did too!!! We loved them. They’re the best. Who was your guide? Ours was Cesar and our chefs were Julian and Pancho. Awesome! They take such good care of you. They really are the best! Our guide was Liscandro (he was hilarious!) and our chef was Walter. I couldn’t believe the food! We ate so much. We gained weight. Welcome to the STWM team! Looking forward to it!